Cheech-Ma-Ham was 40 years old and chief of the S’Klallam tribe when the first white settlers arrived in Port Townsend, WA. These settlers decided his name was too difficult to pronounce so in 1848 they changed it to Chetzemoka and gave him the royal nick name Duke of York. Continuing the trend his son was called Prince of Wales, his two wives became Queen Victoria and Jenny Lind and eventually these nick names led to the present-day Prince family name. In 1855 Chief Chetzemoka signed a treaty giving up all S’Klallam land in exchange for the rights to fish, hunt and gather in their traditional areas but treaties like this one were largely misunderstood by the Indians and eventually led to the Indian Wars of 1855-1856. During this time Chetzemoka presided over a secret meeting to decide whether or not the tribe would kill all white settlers in the area. Nine nights in a row the chief sent a “danger” message to white leaders from Signal Rock until the tenth day when the tribe agreed to spare the settlement. Chief Chetzemoka was celebrated as a hero by the white community and when he died in 1888 he was buried in the white cemetery in Port Townsend, WA. Today both a city park at Signal Rock and a Washington State Ferry are named after Chief Chetzemoka. 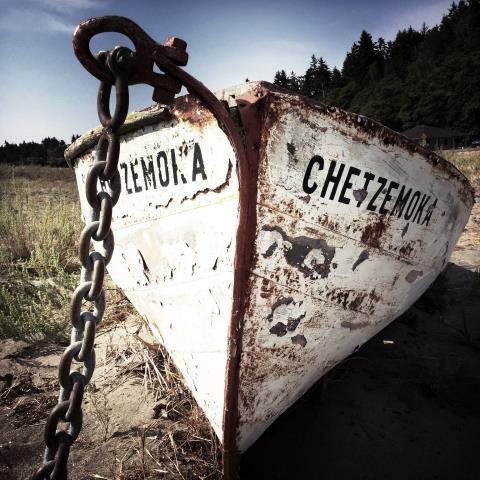 This small Chetzemoka was resting on the beach during our visit to Fort Warden and Port Townsend, WA in August 2015 and my image is posted as part of Sally’s Mobile Photography Challenge: Travel. I’m glad you enjoyed it, Jim. Really enjoyed the story behind the picture. Gave the image meaning. So nice to hear, gray days. Thanks! Enjoyed the back story and the image that provokes one’s own imagination. Happy Photo Challenge. Thanks, Sally. I learned a bit from this post too as I was familiar with the name Chetzemoka but didn’t know the whole back story. Thanks for the prompt which led me to investigate further. Interesting historical details. Actually, very generous of them spare the village in the end. I thought so too, LD. Thanks for the history lesson, Lisa! The old boat looks like it has tales to tell. A wonderful ‘weathered’ shot, Lisa, and thank you for the accompanying history. 🙂 It’s good to know that people can coexist peacefully, isn’t it? Thanks so much, Jo. :). It is nice when two groups find a way to co-exist.